Tropical storm Jangmi, known in the Philippines as “Seniang” weakened to a tropical depression as it moved into the Sulu Sea and NASA’s Aqua satellite captured an image of the storm that showed its eastern side was still affecting the central and northern Philippines on Dec. 30. When NASA’s Aqua satellite passed over Jangmi on Dec. 30 at 5:50 UTC (12:50 a.m. EST), the Moderate Resolution Imaging Spectroradiometer or MODIS instrument, took a visible picture of the storm. 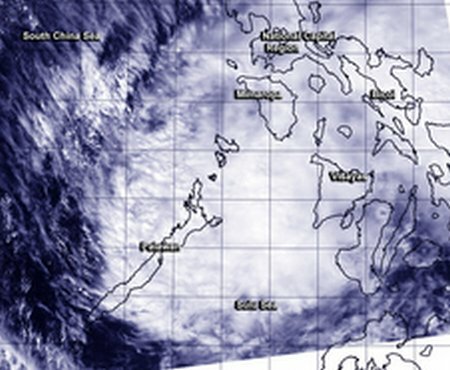 The MODIS image showed that the center of the storm had moved into the Sulu Sea, located to the west of the Philippines, but the storm’s eastern quadrant was still spreading clouds, rains and gusty winds over the Visayas and Luzon regions (central and northern) of the Philippines. By 1500 UTC (10 a.m. EST) Jangmi’s maximum sustained winds dropped to 30 knots (35.5 mph/55.5 kph). However, once it passes Palawan, forecasters at the Joint Typhoon Warning Center expect Jangmi to re-strengthen into a tropical storm for a couple of days before weakening again. Jangmi was centered near 9.9 north latitude and 120.0 east longitude, about 95 nautical miles (109.3 miles/175.9 km) northeast of Puerto Princesa, Philippines. It was moving to the west-southwest at 8 knots (9.2 mph/14.8 kph). Jangmi is expected to continue moving toward Palawan, and into the South China Sea. The extended forecast track takes the storm to landfall in the Malayan peninsula by January 4, 2015.